Show your readers your favorite pieces right on the homepage and make your wardrobe ready-to-shop! The product carousel widget is a third-party widget from an affiliate network – it is not built into the theme. You can only use this section with a third-party code! First, register for an affiliate network of your choice (see this article for tips and recommendations from us: Affiliate for Fashion and Lifestyle Bloggers: Which network should I choose?). Log into your account and follow the steps on their website to create a new widget. You will get a code snippet or a shortcode – copy it. Come back to your WP dashboard. Navigate to Appearance > Widgets and drag the XO – Shop Widget from the left into the section Shop the Edits Area. 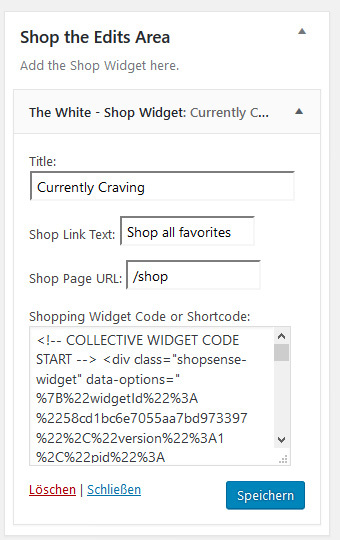 The copied code from your affiliate provider goes into Shopping Widget Code or Shortcode. Optionally, you can add the black button on the right. Add a link to the desired page (e.g. your Shop Page) and the link text that the button should display.